A lot of famous individuals have and will live in New York City, which is part of what makes this city so incredible. On a rather more morbid note, this means that a lot of famous have also died here. Fortunately, in the 19th century there was enough foresight to set aside adequate land for cemeteries for all of those who would need burying as the city expanded. Hence, some very eminent individuals have been buried in the city. Alexander Hamilton was one of the most prominent figures of the American Revolution, as one of the Founding Fathers of the United States, the founder of the nation’s financial system and the country’s first Secretary of the Treasury. A series of disputes arose between Hamilton and his political rival, the incumbent Vice President Aaron Burr, pertaining to the 1804 gubernatorial election. Ultimately, Burr and Hamilton dueled each other on July 11, 1804, which ended with Burr fatally shooting Hamilton. 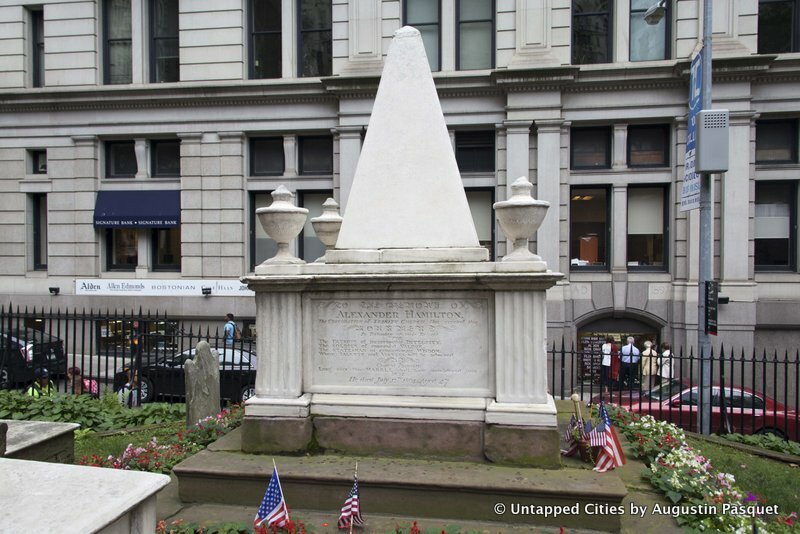 Hamilton was ferried back to Greenwich Village where he died; he was buried in the Trinity Churchyard Cemetery in Manhattan. Hamilton’s wife, Elizabeth Schuyler, lived another 50 years until the age of 97. During this period she co-founded the first private orphanage in New York City. She also helped to raise money for the Washington Monument. Schuyler is also buried in the Trinity Church Cemetery close to her husband. While the most notable interment of Trinity Churchyard is Alexander Hamilton, the burial ground consists of numerous tombs that date back to 17th century, including New York City’s oldest carved tombstone. In addition to the cemetery on Trinity Place, the church established a Trinity Church and Cemetery in Upper Manhattan in 1842. A third burial ground is located in the Churchyard of St. Paul’s Chapel.